We conclude our citywide tour of Newark cemeteries, starting with the burial grounds where Jewish residents and their families were interred. There are several Jewish cemeteries in the vicinity of South Orange and Central avenues, as well as in the East Ward near the Elizabeth line. But people often forget that they exist because they are very small. 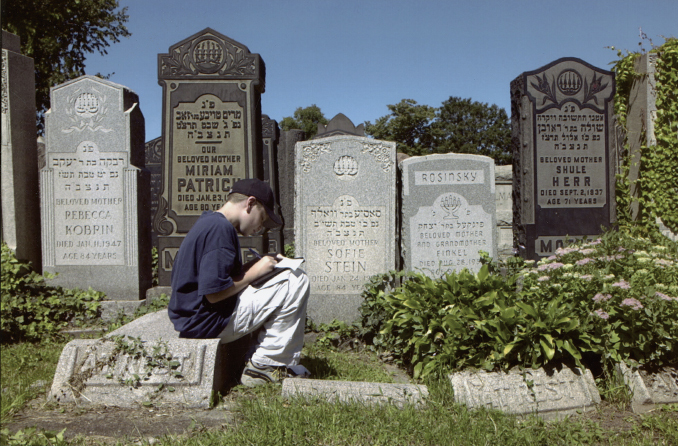 According to a 1996 news article, Newark is home to an estimated 100 Jewish cemeteries where there have been more than 75,000 burials. Even before the establishment of the first synagogue, there was a Jewish cemetery in Newark. But before 1970, there was no regulation of grave sites. Over the years, vandalism and pollution have wreaked havoc on these treasured landmarks. They are all that remains of an important segment of Jewish history and must be chronicled and preserved so that Newark's earliest Jews might be properly remembered. That plea first was sounded in a 1975 Jewish News, a reference to the plight of thousands of graves of Eastern European Jewish immigrants buried in the Grove Street cemeteries of the Ashkenazim. The graves, according to the report, were 'placed closely one to the other; almost as though, even in death, proximity meant security.' The Jewish News went on to say, 'Any day of the week, any holiday of the year, a passerby would see life in that place of the dead. Men praying, mourners leaving a stone of remembrance, people silently greeting old friends and relatives long gone.' By 1976, this was no longer the case. Instead, an observer noted, the cemetery was barren and unkempt. In 1979, The Star-Ledger reported that conditions at the Union Field Cemetery along South Orange Avenue had further deteriorated. Bronze plaques were missing. Copper piping had been ripped out of the walls of the cemetery office. Marble markers had been smashed out of senseless malice. Of the 8,000 graves located on the two-acre cemetery in the city's Vailsburg section, 300 to 400 gravestones had been nearly destroyed or damaged with a sledgehammer. The Star-Ledger commented that it was one of the worst desecrations of a local cemetery in over 60 years. But help was on the way. A fund was established by Beth El Memorial Parks Foundation to assist the United Jewish Federation of MetroWest to begin to restore these sites. And Federation of MetroWest Historical Society volunteers are working on a computer listing of the names of the deceased buried there along with their birth and death dates and grave locations. ''We don't live in the shtetle (village) in Eastern Europe any more, where parents, grandparents and great-grandparents lived in the same place for generations,' one man said. Because this is a mobile society, the keeping of the past apparently now belongs to an even greater community than just the immediate family, he maintained. In spite of fear of crime and the lingering image of the 1967 riots, cemetery visits have again become increasingly popular. Much of the credit for this is due to efforts to insure visitor safety by individuals and organizations. In 1994, the New York Times reported on the sixth annual Cemetery Historic Visit to Newark's various cemeteries sponsored by the Sitorim (Guardian) Society composed of Jewish public safety officers, the Essex County Sheriff's Office and United Jewish Federation of Metro-West. The pilgrimage during the High Holy Days of fall was nurtured by these agencies under the leadership of David Mallach. They drew more than 1,000 visitors to family and ancestral graves in a string of cemeteries in three areas along South Orange Avenue between Grove Street and the Garden State Parkway. Grove Street, Talmud Torah, Union Field, B'nai Abraham, and Oheb Shalom cemeteries were the centers of activity. The Jewish Historic Cemeteries tour was sponsored under the direction of Beth El Memorial Park Foundation and the Cemetery Committee of the Community Relations Committee of the United Jewish Federation of MetroWest. Despite fears of robbery, purse snatching and car theft, many visitors made their way back to Newark for the first time in years. The first of the three areas visited was the Grove Street Cemetery at Grove, South 20th and Grain streets, where 41 separate burial grounds are maintained with names such as Congregation Adas Israel Mischanayos, Congregation Anshe Russia, Toras Ernes Workers' Circle, the Brisker Cemetery Association, Lodge #686 Inc., the Hebrew Free Burial Society and the Ind. Baron Rothchild Verein. The Talmud Torah Cemetery is located near the Garden State Parkway just off Grove Street and includes 21 sections with names such as Oesterreicher K.U.V., True Friends, Independent Brisker, Liberty Young Men, Newark City Lodge #106, Old Chapel and the New Talmud Torah. Founded in 1855, Evergreen Cemetery is partly in Newark, Elizabeth and Hillside. It occupies 115 acres laid out in an irregular, picturesque sylvan design. The nonprofit, interdenominational cemetery occupies a portion of Newark's old Lyons Farms section and was designed by Ernest L. Meyer of Elizabeth, who became that municipality's city engineer. The cemetery follows all the rules for a romantically landscaped last resting place in the middle of a northern New Jersey cityscape. It incorporates winding paths, natural terrain and careful tree planting. Its roadways are named for catalpa, pin oak, white ash, black oak linden, red oak and sugar and Norway maple. More than 300 varieties of birds have been identified in its leafy branches overhead. At last count, more than 175,000 graves populate the cemetery. There are 40 buildings on the property, five cemetery structures, and the remainder are mausoleums. The most important building is the Tudor-style chapel, designed by George Poggi, who later became the architect of choice in Elizabeth. All manner of people are buried in the tri-city burial grounds. In Elizabeth, more than 245 members of the early Woodruff family predominate. In the Hillside section are a number of members of the Crane family, including Newark's most famous author Stephen Crane, author of the 'Red Badge of Courage,' and Mary Mapes Dodge who lived in Newark's Lyons Farms section. She was the author of 'Hans Brinker.' Also interred there are George Poggi the architect, and Charles King, the unofficial mayor of Newark's Chinatown. In Newark portion, too, are the graves transferred from the old Franklin Street Methodist Church Cemetery and the Third Presbyterian Church. Newark is also host to graves of parishioners of St. John's Ukrainian Church located in Vailsburg. In addition, most of the city's large gypsy population is buried in this portion of Evergreen. Well maintained, the cemetery was recently added to the National Register of Historic Places, joining Newark's Mt. Pleasant. Potter's Field, later renamed Floral Rest, was established in 1869 west of Routes 1 and 9 and approached by Haynes Avenue and Bessemer Street in one of the city's most isolated locations. In 1940, The Star-Ledger reported that 2,000 burials had taken place in the past 13 years and that 300 were buried in 1939 alone. An old wooden barnlike building served as morgue and tool shed. At that time, the plot was being landscaped with hedges and walks to make it look more like a burial ground and not a potter's field. In May 1951 the city rededicated the cemetery as Floral Rest, and spent additional funds on its operation. A fence was added and a gateway was put up bearing the new name. But by the early 1950s, the cemetery's condition reverted back to a potter's field state and high weeds were again covering the recently new metal markers. In 1953, Public Affairs director Salvatore A. Bontempo indicated that the whole operation should be discontinued as an economic measure. From then on, the poor were buried in other cemeteries. The cemetery was officially closed in the 1960s. In September 1998, 84-year old Elsie Lascurain complained of the city cemetery's condition. By that time, 18,000 individuals buried there were lying beneath an area now used for industrial storage and a layer of dump. The cleanup of the area began in late 1998. Holy Sepulchre Cemetery, located in Newark and East Orange, is one of the city's oldest, largest and best-maintained cemeteries. It occupies approximately 125 acres and is approximately two-thirds in Newark. The cemetery is surrounded by Central and South Orange avenues, the Garden State Parkway and Grove Street. Contrary to popular belief, when the Parkway was constructed in the 1950s, not a single grave was relocated by its construction. Only later was the land west of the Parkway added. Basically, the Parkway ran in the bed of the old Oraton Parkway. Driving through the cemetery from its entrance at Central Avenue to the rear of South Orange, one passes through three distinct areas of name changes. At the front gates, many monuments reflect the community's Irish heritage. The central part of the cemetery appears to be heavily Italian, and the far end has a distinct Germanic flavor. In all, more than 190,000 graves are spread throughout the cemetery. Most of the plots have been purchased and await future occupants. Administration of the cemetery falls under control of the Archdiocese of Newark's Catholic Cemeteries, which is supported through the Maintenance and Preservation fund. In the 1940s, as many as 3,000 burials occurred annually. Today, many of Newark's Catholic population go to Gate of Heaven Cemetery in East Hanover. Famous Newarkers making Holy Sepulchre their final resting place included Vincent Murphy, former Newark mayor and labor leader, and members of the well-respected Brennan family, although William Brennan, the U. S. Supreme Court Justice, is buried at Arlington National Cemetery. Other well-known occupants include Lawrence Corcoran, early baseball great; Robert Seton, nephew of Mother Seton, and Michael Augustus Corrigan, third archbishop of New York. Whole groups of Newark policemen, as well as a large number of Catholic clergy, are to be found there, too. Today, Holy Sepulchre is in excellent condition and its future seems secure. More than a million people have been buried in the various cemeteries of Newark from earliest days to the present time. They have been laid to rest in everything from marble mausoleums to paupers' graves. They have been honored with some of the finest monuments, although some have been sadly neglected in death. Some of the burial grounds are in excellent condition. Others lack financial stability to survive into the future. But, in general, attention is being paid to honoring family, friends and the forgotten of the past.